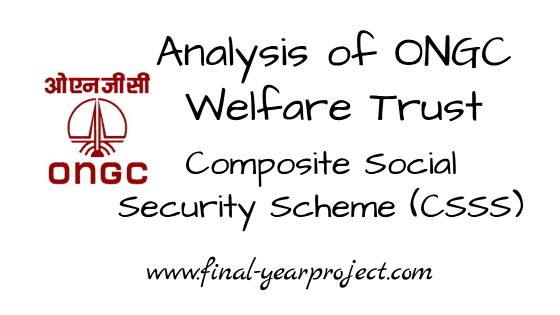 This is MBA project report on "Analysis of ONGC welfare trust composite social security scheme (csss)". Oil and Natural Gas Corporation has been ranked as the Top Energy Company in India, in the coveted Platt’s top 250 Global Energy Company Rankings 2014. You can also Subscribe to FINAL YEAR PROJECT'S by Email for more such projects and seminar. As per SWOT analysis of ONGC is the only company in India who is involved in offshore construction activities relates to oil and gas projects for more than two decades. It has rich experience over the last 25 year in its execution and possesses abundant data associated with these projects. ONGC contribute 90% of Indian crude oil production. Further is analysis tells about the operational cost of ONGC, which is among the lowest in the world and its reserve level is equivalent to 23 years of production. ONGC can boost of installing 28 processor platforms, 132 well platforms and more than 4000 KM submarine pipelines. Another area of strength of ONGC is its commitment and quality of maintenance management. 1. The main purpose is to render a better understanding of CSSS (Composite social security scheme). 2. To understand the planning and management of CSSS. 3. To measure the financial soundness of the trust by analyzing various ratio. This is a well researched MBA project report on "Analysis of ONGC welfare trust composite social security scheme (csss)". Use this report only for your reference and study purpose. Thanks to the author of the project.